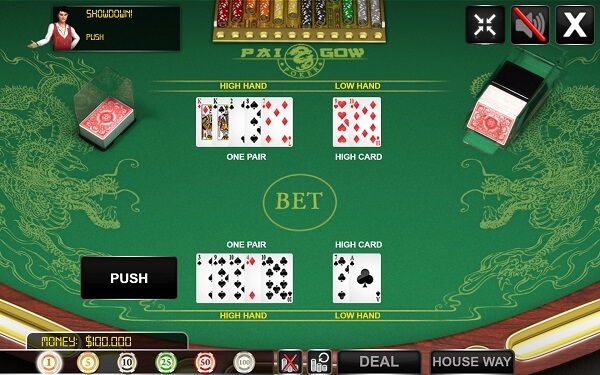 Fans of this unusual seven-card poker variant should be keen to try mobile pai gow poker for two reasons: convenient constant access, and the chance to practise setting hands without risking real money. Creating the best two poker hands from seven cards requires some experience, and most mobile casinos Canada will have a demo mode for all their games, in which players can bet with credits only while they learn the finer points of mobile pai gow poker. The biggest draw-card of mobile pai gow poker, of course, is constant access whenever a player feels like a little action. Some casinos offer mobile pai gow poker for instant play via the mobile device’s browser; others let players download free apps. In both cases, the player needs access to an online connection to play for real money. The added bonus of a mobile pai gow poker app, of course, is that players can indulge in free demo play even when offline, so an app is a good idea for players who still need plenty of practice. Based on an ancient Chinese tile game, pai gow poker was a card-based reinvention thought up in southern California in 1985, the brainchild of card-club owner Sam Torosian. However, he took some terrible legal advice and believed that casino games could not be patented. As a result, many other casinos got to introduce the game to their tables for free, without paying Torosian a cent in royalties. Pai gow poker makes it possible to bet against other players in a process known as banking, but many players do not even bother with it. The real skill in mobile pai gow poker is in learning how to create the best possible hands from the cards dealt. Mobile pai gow poker, like the land-based version, is played with a standard 52-card deck plus one Joker. The Joker is semi-wild, meaning it can only be used to complete certain poker combinations; it cannot simply stand in for any other card. In most versions of mobile pai gow poker, the Joker can substitute for an Ace, and also be used to complete a straight, a flush, a straight flush or a royal flush. Once the player has placed a bet, both player and dealer are dealt seven cards each. The player must then set their hands, making a five-card high hand and a two-card low hand. The poker combinations in the high hand must be stronger than those in the low hand. The skill lies in being able to see the best division of the cards; any poker combination is possible in the high hand, but of course, only pairs or high-card hands are available in the low hand. When the player has set their hands, the dealer’s hands are set according to a system called the house Way. The two hands are then compared, high-to-high and low to low. The player must beat the dealer in both hands to win even money. If each wins one hand, the result is a push. However, any drawn hands go to the dealer, so one loss and a draw, or two draws, will sink the player as effectively as two losses will. There are one or two more specific rules that can vary according to which version of mobile pai gow poker is being played. Players will be able to find all these rules on the mobile pai gow poker sites they access. Play Craps Game on Your Mobile!